Playing board games with my siblings on cold, snowy days is one of my favorite childhood memories. I learned so many skills as we played, and my siblings and I still play games when we get together. I want my girls to make similar memories with each other. That's why we filled one of our playroom cabinets with games in preparation for a game night with our friends in celebration of Game and Puzzle Week, observed the third week of November. I invite you to join us as you teach your kids important skills and have fun. With our busy schedules, my girls and I sometimes feel very disconnected from each other. That's why we schedule a weekly game night. It's intentional time we set aside to connect with each other and bond. Most of our favorite board games require at least two people to play, but we parents, caregivers, and teachers all know that conflict can happen when kids play together. I see board games as an opportunity to help kids cultivate social skills. My girls have learned to take turns, share, and stay in their own personal space thanks to board games. As toddlers, my girls could only sit still for a few minutes as we played games. I knew, though, that their attention span would increase with practice, so we kept playing fun, exciting, and engaging games. Now they like to challenge me to marathon sessions of Monopoly and other games, and they can focus and pay attention as they read books, take tests, and complete chores. My grandfather taught me to play chess. It took me a long time to learn how to strategize and think through my moves, and I never did beat him, but I'm grateful for those lessons. I've introduced my girls to chess and other complex games, too, so they can learn to develop strategy and work on thinking ahead. With these skills, our kids can think beyond the current moment, plan ahead, follow multi-step directions, and become leaders in school and life. 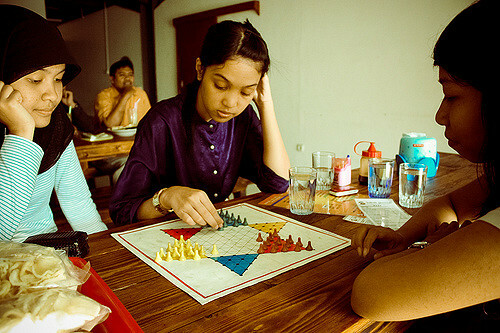 One day, I watched my girls play a board game and realized that they communicate a lot as they play. They started by discussing which game to play. Then, they decided who would go first, showed compassion and empathy when they sent each other back to home, and read nonverbal cues. In a safe environment as they play, our kids learn how to communicate better with others. It's natural for kids to want to win all the time, and they may even cheat or trash-talk their opponent. I support adapting a game's rules so it's not too hard for young kids, but we must also teach our kids to have fun, play by the rules, and be kind whether they win or lose. We can use board games to achieve these goals and help our kids become good sports. Playing board games taught my toddlers dozens of skills they needed to know for success in school. To name a few, they learned letters, numbers, grouping, counting, visual perception, color recognition, hand-eye coordination, and manual dexterity. Even now, we reinforce important concepts my girls use in school every day when we play games, and we have fun as we learn. It's Game and Puzzle Week, and my girls and I plan to celebrate with game night. We'll have fun together and gain these seven benefits. How do your family's favorite board games benefit your kids?